Again whilst on my way to see my cousin at his flat, I saw this EOL bulkhead thats been going on for 2 months or more!!! The ballast wont like it, but these do have magnetic tridonic ballasts so they are good quality. Nothing much, Philips ballasts are good too. 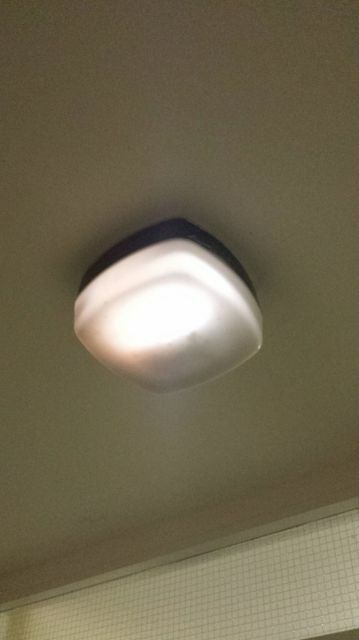 In a friends flat block they kept fitting 28w 2D in 16w fixtures so there were a lot of lights out, as they wouldn't start. No they were round ones ment for 16w but could fit 28w for different ballast. I told the cleaners who change bulbs that they were for 16w tubes when I was at my friends but they didn't put the correct lamps in. so they are still killing the ballasts and there is not much light in the night. Not much light in the night doesn't sound too good but anyhow what colour temperature are the 2D bulbs is it? Have you reported it to the landlord ? The old London flats used to be lit with pearl Rough Service bulbs, the caretaker, who will be nameless, supplied all the fish keepers of the time with these lamps as they could be used above the tanks and as they did not get too hot they did note break going back a very long time lots of these flats been pulled down now. Thanks Peter, that was the bad side of things, look up Ronan point on Google sure they will mention it. I never lived in flats either would have missed not having a garden. Hi Peter what do you think of those Fitzgerald fittings I put up for Lou to see? My house was built 1930s I think it has got a good garden nearly 100ft were I grow my succulents in greenhouses. Hi thanks Peter Have you seen my garden pics on You Tube?